International DJs Hannah Bronfman and Brendan Fallis’s passion for music is matched only by their passion for each other. The soon-to-be-married pair talk about how they make time for one another, what they think about being called a power couple, and how the Hamptons offers a respite from their busy schedules. No, this isn’t a perpetual vacation; rather, the world is their office. As successful international DJs, the two, who were engaged last August, travel half the year, spinning at a variety of high-profile affairs, like VH1’s Save the Music charity party last year in Sagaponack and the recent Veuve Clicquot Polo Classic at New Jersey’s Liberty State Park, and regularly adding their musical flair to fashion industry events. That mutual encouragement has turned Bronfman and Fallis into genuine multihyphenates. A New York native, Bronfman is also a model and the face of several global ad campaigns, a health guru with an impressive social media following, the host of an online show for PopSugar, and a cocreator of the app Beautified, which allows users to book last-minute beauty and wellness appointments. Fallis’s résumé is just as impressive. The Canadian is also a highly sought-after model for brands like Banana Republic and Revlon, and he gained worldwide attention when he created the track "Day and All Night" (with vocals by Kate Moss) for Stuart Weitzman’s Fall 2013 campaign. He also boasts two tracks that made the top 50 on Hype Machine’s Most Popular Remixes chart. Although their careers may take them across the globe, the soon-to-be Mr. and Mrs. consider the Hamptons their relaxing home base. Fallis and Bronfman spoke exclusively with Hamptons about their collaborative process, their fondness for the East End, and how they make it all work (hint: Google Calendar). How do you make time for each other with such hectic schedules? 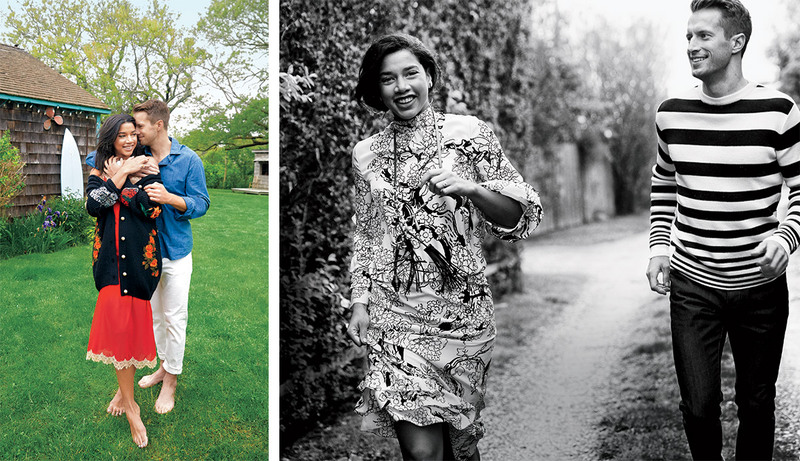 Hannah Bronfman: We share a calendar, which makes it so easy. If we’re going to make plans with friends to have dinner, I don’t need to hit him up to see if we can make it work. I can just look at our calendar. It’s just about communication. Brendan Fallis: We barely see each other at home in New York, so our travel time is really our time to bond. It seems like you guys get to work together often. BF: We do as much as we can. We enjoy each other as friends and enjoy our time together a lot. It’s the saving grace of our relationship. We can go to the same festivals, whether it’s SXSW or Coachella. Our relationship could be really tough if we were constantly going to opposite places in the world. We’ve been super fortunate this year, being able to go to the same places. We don’t deejay together a ton, but we’ve had the privilege this year of doing two photo shoots together, including this one, which has been great. You’re both DJs and very creative. Do you collaborate together much? HB: There are so many inspiring couples that work together and work really hard. We’re definitely not the type of people who live completely separate lives and we’re just coming together for dinner every night. We want to have that work/life relationship. I think we’re really in growth mode right now and we’re still really trying to build our careers and also build for the future. BF: Exactly. While we’re focused on our separate brands, we’re also talking about what we can create together. What do you think when people refer to you as a power couple? BF: It’s obviously a compliment. People think we’re doing cool things, and we’re super fortunate to be in this position, and have worked hard to get here at the same time. HB: It’s also really inspiring for us. When people say that about us, we’re like, "Uh…" We definitely think that there are way more ways for us to be killing it. So it is motivating for us to have that. Hannah, since you grew up in New York, did you spend a lot of time in the Hamptons? HB: I kind of pride myself on being a native New Yorker, and I had the luxury of being able to go out to the Hamptons throughout my upbringing. It’s really nice to be able to share that with Brendan. BF: Moving to New York from Canada, I’d take the train out East not knowing anything and just crash at somebody’s rental house. So for me, the Hamptons has really changed because of having Hannah. It’s nice to meet her community and get an insider’s look. It’s become more of a special place to me. HB: Not only is he not a New Yorker, but he’s not from the States, so it’s really nice to be able to share each other’s places that mean so much to us. Actually, at our engagement party, we had coasters made that had Hamptons on one side and Muskoka [where Brendan’s family vacations] on the other. Speaking of engagements, what are you most looking forward to about getting married? BF: We’re excited for all the things that we don’t even know are going to happen. I really enjoy getting through all the ups and downs. HB: I think we’re also really excited to start a family together. Do you think you’ll pass on the tradition of going to the Hamptons to your kids? HB: Yes, absolutely, we would love to be able to do that. BF: We were talking about that today. We’d love to introduce our kids to the Hamptons and Muskoka, where I grew up. HB: Having our children experience both sides is going to be a huge thing for us, especially because we’re both very family-oriented people. We’re just looking forward to building a future together.